Oscar nominee Manchester by the Sea's genius is not in its ability to provide answers. Rather, it forces us to locate the sublime within the unbearable, says Vikram Johri. IMAGE: Casey Affleck in Manchester by the Sea. 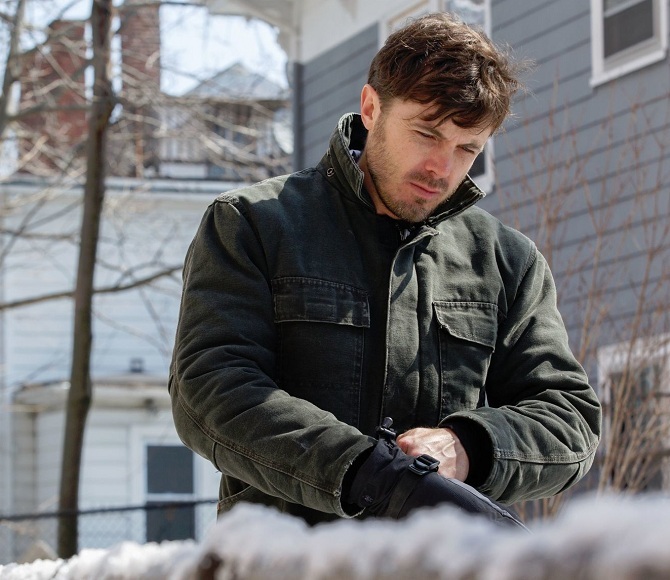 Manchester by the Sea, for which Casey Affleck won a Best Actor Golden Globe in early January, is a brutal film. Based in the seaside town of Manchester, Massachusetts, the film is set against a backdrop of overcast skies and incessant snow. More severely, it uncovers a tragedy from which redemption is impossible, leaving scope only for a cold, resigned acceptance. Affleck plays Lee Chandler, a janitor in Boston, who passes his days in a blur brought on the by the disaster that sits like a clot at the heart of the film. Memory plays tricks on him -- in the midst of cleaning toilets and shovelling snow, he imagines the past as if it were the living, breathing present. Director Kenneth Lonergan switches between timelines at random, an unsettling effect that accentuates the weight of the past. We learn that the past was a happier place. There was a wife Randi (Michelle Williams) and three children. There was an older brother, Joe (Kyle Chandler), and little nephew, Patrick. There were friends and the opportunity to fish in the grey sea abutting Manchester. Joe suffers a heart ailment that anchors the film's beginning and sets the stage for its central premise. When he passes away it comes to Lee to become the guardian of Patrick, now an adolescent played by Lucas Hedges. Lee grudgingly accepts the responsibility, and it is emblematic of the times we live in that unless we see the film, this line automatically translates to how the modern world is not meant to sustain relationships. The truth, on the contrary, is far more damaging. Lee does not wish to return to Manchester, the place where he lost his family in an accident that he unwittingly orchestrated. Randi left him and the town turned its back on him. Once it has outlined these elements, Manchester proceeds to distil their effects on Lee. Affleck plays him with the sort of measured intensity that makes one wonder how relatively privileged actors channel celluloid traumas that they have no acquaintance with. He speaks haltingly, and rarely smiles. Even important conversations lose him. He lives mostly in his own head -- and when it gets too much, he goes to a bar and picks up fights with strangers. The film is a bruising portrait of a man who wishes intensely to disappear. He had tried to kill himself, and when that did not succeed, he settled into a faithless, joyless existence that allows him to function in a barely-there way. The only way he can live is if he shuts himself in. He does not want to live, so it is not a choice he has made for his sake. It is rather an option of convenience, a fait accompli that, he believes in his heart, will keep him from causing any more trouble. So, when life beckons in the form of Patrick, Lee does not know what to do. Manchester upends our traditional assumptions about character motivations in film. Here is a man who is devoid of all agency and manipulation, so that we, as viewers, begin wishing the burdens of the world upon him in order that he escape the horrendous cage he has built around himself. We applaud when Patrick makes him drive around town as the lad hops from one girlfriend to the other. We wish some tiny, livable trouble on a man irrevocably transformed by his enormous tragedy. In spite of the film's atmosphere, there is plenty of lightness. The 20-year-old Hedges plays Patrick with an abandon that blurs the line between reality and make-believe. Williams as Randi occupies the screen for no more than 10 minutes, but as with her other short performances (such as Brokeback Mountain), she is electric as the woman whose heartbreak ultimately pales before her husband's. 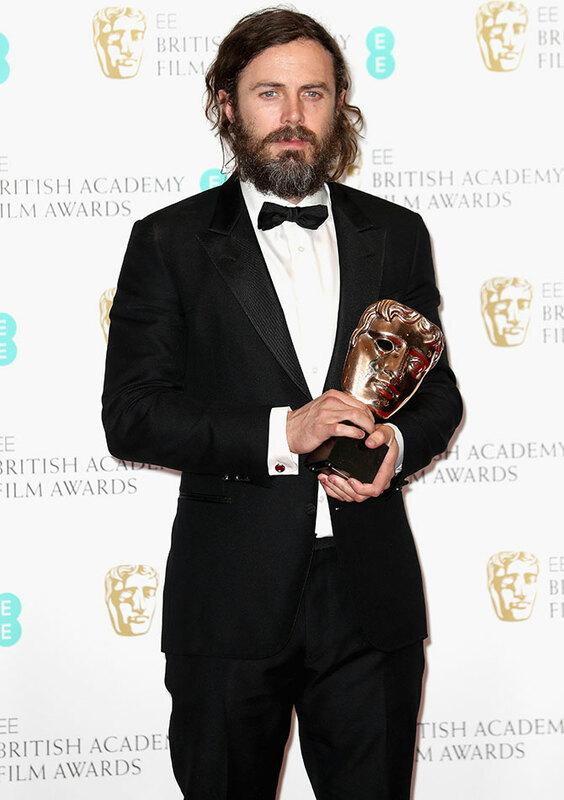 Manchester is nominated for Best Film, Actor and Director at this year's Oscars. Like last year's other success La La Land, it shines a magnanimous light on the private grief that men endure, in romance or otherwise. But unlike that film, it takes its protagonist's grief as a given, a fact of life that can be dodged but never truly overcome. Towards the end, when Lee has finally made a decision regarding Patrick's guardianship, he tells his nephew: "I am sorry, Paddy, but I can't beat it." Rarely has so much been said on film with so little. Lonergan, who has had middling success with his two films before this, will not lack for backers after Manchester. The film's genius is not in its ability to provide answers. Rather, it expands our empathy and forces us to locate the sublime within the unbearable.